After giving away Programming Microsoft Robotics Studio PDF digital eBook, Microsoft Press is now giving away “Microsoft Visual C# 2008 Express Edition: Build a Program Now!” book as part of 25th anniversary of Microsoft Press. 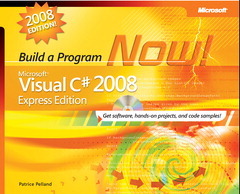 “Microsoft® Visual C# 2008 Express Edition: Build a Program Now!” book (ISBN: 9780735625426) is written by Patrice Pelland, and allow readers to learn how to program with Microsoft Visual C# 2008 Express Edition. Register and download the free “Microsoft Visual C# 2008 Express Edition: Build a Program Now!” e-book in PDF format from http://csna01.libredigital.com/?urrs4gt63d.